Online periodical regarding research of the works of the Collection. When describing his method of perspective in his treatise De Pictura, Leon Battista Alberti compared a painting with an aperta finestra, an open window. 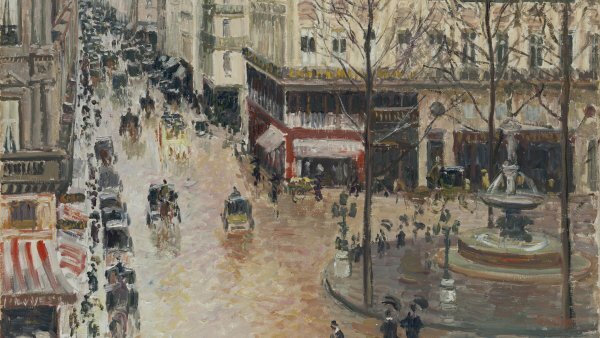 Extending this Albertian metaphor beyond the strictly optical, the new on-line periodical of the Thyssen-Bornemisza collections aims to open a window onto a different world through each work of art. Douglas Cooper, A Cubist Love Story. The Death of Hyacinthus by Giambattista Tiepolo. The Rider and the Dream: The relationship between Franz Marc and Wassily Kandinsky through the works they exchanged. An Exception in European Collecting. Baron ThyssenBornemisza and Nineteenthcentury American Painting. “The New Mechanism for Picture Making” Early Works by Raoul Dufy in the Carmen ThyssenBornemisza Collection. Cézanne: Portrait of a Peasant, 1905–6. Lucio Fontana between Venice and Milan: Spatial Concept, Venice Was All in Gold. El tío Paquete:: Goya’s Prefiguration of Esperpento. The Macabre in the Work of Hans Baldung Grien. Rousseau and Fontainebleau, beyond Brushes. Camille Pissarro: Rue Saint-Honoré in the Afternoon, Effect of Rain, 1897. New Sources for the Study of A Grandmother. 400th Anniversary of the birth of Gerrit Dou. Anatomy of the muse: In Misia´s Footsteps. Emilio Castelar, Gustave Arosa and Paul Gauguin. Giacometti and Portrait of a Woman. The Story behind the Research: Matta and the Open Cube. Matta: when the invisible reveals itself. Watteau’s Vision of the Commedia dell’Arte. Gaspar van Wittel, The Piazza Navona: episodes, scenes and characters on a market day. Composition of Iván Kliun. A revolutionary painting. A new attribution for Prison. Tatiana Glebova and the working methods of the Masters of Analytical Art. Thyssen and Ketterer: two friends and a collection. Bronzino and Cosimo I de’Medici. The Power of an Image. “Art comes out to engage with life”. Other ways of seeing. Baron Thyssen and Lucian Freud’s Atelier. A wartime Artist. Henry Moore and his Shelter Drawings. History of a Portrait: New information on the provenance of David Lyon by Sir Thomas Lawrence. Evening by Edvard Munch. Towards an image of melancholy.